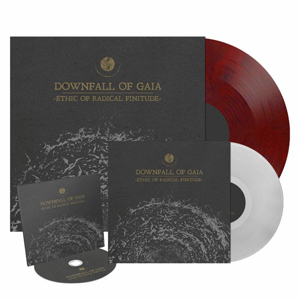 February 8th sees DOWNFALL OF GAIA release their new album, Ethic Of Radical Finitude. In anticipation of this release, DOWNFALL OF GAIA have now launched a video for the second single, "We Pursue The Serpent Of Time", which can be viewed on KNAC.COM HERE. DOWNFALL OF GAIA comments: "Today we're excited to share the music video for our song "We Pursue The Serpent Of Time", the second new song of our upcoming album, Ethic Of Radical Finitude! This time we're joined by our friend Nikita Kamprad from DER WEG EINER FREIHEIT for some guest vocals, and we hope you enjoy this collaboration as much as we do! Thanks for listening!" Ethic Of Radical Finitude is the international quartet's most melodic, most structured and most dynamic release to date, once more building upon the epic and unique sludgy, crusty, exploratory metallic sound that has organically evolved with every release. "It combines elements from our earlier releases with the path we took on Atrophy (2016)," states guitarist/vocalist Dominik Goncalves dos Reis. "There are long atmospheric parts with enough time to breathe, enough time to unfold, and on the other side there are harsh and melodic blastbeats. Each song is some kind of journey, with emotional ups and downs." "The Grotesque Illusion Of Being"
"We Pursue The Serpent Of Time"
"Guided Through A Starless Night"
"As Our Bones Break To The Dance"